I would like to save all of my text messages that are on my phone to a file on my computer. The WP cloud did a good job of saving them across new devices and software resets, but I'm going back to a different phone OS, and am kind of sad to lose all of them. I would like to know if there is any conceivable way to get a dump of all my texts in a file, so that I may use that file to figure out how to import it to my new phone. I have a Lumia 920 and a Windows 8+ PC. As I have been searching for this for ages and there were no actually useful responses, I want to post this here as this is the first result that always appears on my search. 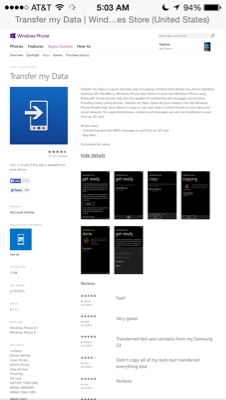 There IS an official way to export your text messages and the app even comes bundled with every single Nokia Lumia phone. The app, from Microsoft Mobile, is called Transfer My Data, but it doesn't preserve sent messages. The functionality is hidden in the 'more' menu at the bottom of the first screen (the 3 dots). In that menu is an option to export to SD card where you can export contacts, sms and mms. Hope this helps for anyone else who has been trying to find this info! Of course, if your phone doesn't have an SD slot then it will be of little to no help, but there is hope! After some research it seems like there is no way to be able to do this. Can SMS backups be viewed online (on Outlook.com)? Are SMS backups visible at all? This contradicts the source above but officially speaking, there is no way that one can see backed up SMS. Clearly, someone actually spent some time trying to tweak the URL as shown in the forum above to be able to see some of the backed up text messages. "backup / export texts messages to xml or document format." "Export/Import Text Message Backup from SkyDrive"
"Enable export or email of SMS text message threads from Windows Phone"
Was this possible in the past? Yes, people found a way to do it for Windows Mobile. With the contacts+message backup app there is now an official way to export your texts. This app only used to work on devices with SD Cards, but has been updated to work on all devices as far as I can tell. After installing the app, open it from your settings menu (you won't see it in your installed apps list). If you do not have an SD Card in your phone, use the appbar menu to choose a folder for your backup. Afterwards you can choose what you want to backup - either sms, mms, contacts, or all of them. SMS and MMS will be stored as an XML file which you should be able to convert to any format you need. I save my text messages by clicking on the message I want to save. Choose the copy option. The open a file in OFFICE. Edit the file. Click the paste button, and the text message that was copied into the message buffer will appear in the WORD file. Save the WORD file. The answer is No, there is no official way to manually back up text messages. But there is a setting in BACKUP that will save it to the cloud in some unforeseen place that you can't access, but you can retrieve them for use on a new phone. I use text (and email) to communicate with my clients all the time, and I need to save the text so I have a record of what was said and when. Also if they are needed in court for a dispute, they need to be saved in a way that is tamper-proof. I am guessing that with a court order they could get all your messages, I just don't know how long they are kept on the cloud? Not the answer you're looking for? Browse other questions tagged 8.0 sms backup or ask your own question.